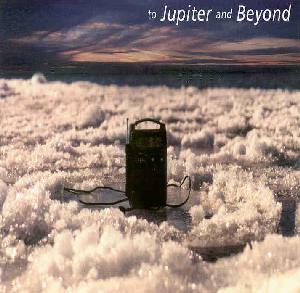 Various Artists - "To Jupiter And Beyond"
The Roswell Incident plays droney, ethereal Shoegazer space. Sianspheric have been reviewed in AI issue 5 & issue 9. Theirs is a brand of noise drone that succeeds in retaining a gorgeous floating quality. Meditational music for drone freaks. One guitar plays searing space lines and the others create a mind expanding comtemplative atmosphere. Beautiful stuff. Land have been reviewed in issue 8 & issue 9. They play noise drones with a bit of rockin' rhythm and a symphonic edge. Velvet Kelvin's track includes a fuller wall of drone sound, but still maintains a celestial quality. I liked this one and unlike most of the tracks on this disc it has vocals. Your Team Ring's contribution is an interesting guitar instrumental. I liked the varied sounds but it cries out to be longer and more developed. Luminator plays what to my ears sounds like a Shoegazer version of Pink Floyd's "Us and Them". At 13 minutes this is the longest track on the disc, and while the music is really beautiful there's little development, making it hard to justify its length. Still, I found myself entranced througout and would be interested in hearing more from Luminator. Eleven Shadows is a project by Ken Lee who is also Dither, another disc reviewed this issue. (CLICK HERE to read) It consists of Middle Eastern chanting on top of hypnotic drones. Interesting, but another tune that needs further development. Doug Michael & The Outer Darkness is another somewhat symphonic piece. The track is a very well crafted instrumental consisting of intense, cosmically rockin' music that stirred up numerous otherworldy images. We only get a taste of the guitar but it has a David Torn sound that Michael quotes as an influence on his web site. I really wanted this one to go on longer. Fear Of Dolls is similar to Doug Michael's track. Great heavy guitar drones and well timed loops. Head Like A Buffalo plays an excellent track and is the one full blown rocker on this disc. Iggy Pop meets Hawkwind at a party for Omnia Opera. Killer psych tune. Gotta hear more from these guys! Mother Dust plays meandering noise drones that goes on way too long. Finally, Del plays noise-psych with a heavy droning industrial edge. I liked the atmospherics. In summary, a very cool compilation from a label to watch out for. For more information you can visit the Aporia Records web site.